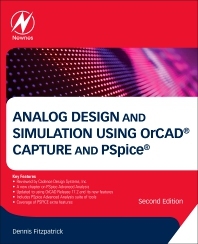 Analog Design and Simulation Using OrCAD Capture and PSpice, Second Edition provides step-by-step instructions on how to use the Cadence/OrCAD family of Electronic Design Automation software for analog design and simulation. The book explains how to enter schematics in Capture, set up project types, project libraries and prepare circuits for PSpice simulation. There are chapters on the different analysis types for DC Bias point, DC sweep, AC frequency sweep, Parametric analysis, Temperature analysis, Performance Analysis, Noise analysis, Sensitivity and Monte Carlo simulation. Subsequent chapters explain how the Stimulus Editor is used to define custom analog and digital signals, how the Model Editor is used to view and create new PSpice models and Capture parts and how the Magnetic Parts Editor is used to design transformers and inductors. Other chapters include Analog Behaviorial models, Test Benches as well as how to create hierarchical designs. The book includes the latest features in the OrCAD 17.2 release and there are exercises with step by step instructions at the end of each chapter that enables the reader to progress based upon their experience and knowledge gained from previous chapters. In addition, there are new chapters on the PSpice Advanced Analysis suite of tools: Sensitivity Analysis, Optimizer, Monte Carlo, and Smoke Analysis.The chapters show how circuit performance can effectively be maximised and optimised for variations in component tolerances, temperature effects, manufacturing yields and component stress. Dr Fitzpatrick is a Reader in Biomedical Engineering at The University of West London, where he also leads the Biomedical Engineering Research Group. He has a BEng degree in Electronic Engineering, a PhD in Bioengineering and is a Chartered Electronics Engineer and a Fellow of the Higher Education Academy. His primary research interest is in the use of Functional Electrical Simulation (FES) for the restoration of bladder function and restoration of gait in stroke and spinal cord injured patients. His research focuses on the design and development of implantable medical systems. His recent book 'Analogue Design and Simulation using OrCAD Capture and PSpice', also published by Elsevier, has sold worldwide to highly acclaimed reviews in numerous prestigious electronic engineering journals such as EDN and Electronic Times and is officially endorsed by Cadence Design Systems.